Ability to save username and password (login) details is a common feature in number of Windows applications. Programs like Google Chrome, Microsoft Outlook, Firefox, Internet Explorer allow users to save login password details. This results in quicker login into web accounts of email, social websites like Facebook, as there is no need to manually type username and password every time you attempt to account login. Password Security Scanner is a free portable utility that neatly list all username – password information stored corresponding to each application program on your Windows computer. Best part, there is no configurational setting as utility automatically scans for saved login information and display it in a tabulated format. 1. 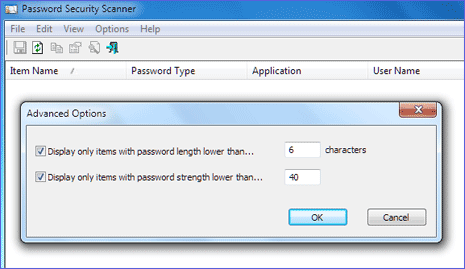 To get started, download Password Security Scanner tool on your Windows PC. Double click to unzip downloaded file and then launch the program utility. It will scan for stored login password information and list results automatically. 2. Program window will display stored login information without revealing the actual password. Every row will show associated program name like Firefox along with saved username and length of the password (and not the actual password). You can press F9 key to perform advanced searching for password information. It allows you to filter and show only results for password length or password strength lower than specified value. For sure a handy tool for keep check on password and login information being saved by different programs on your Windows PC. IE passwords can be retrieved using registry hack … “KEY_CURRENT_USER\Software\Microsoft\Internet Explorer\IntelliForms\Storage2” give it a try.